The new 1100GTO German Equatorial Mount incorporates the design features of the 1600GTO in a smaller, more portable package. 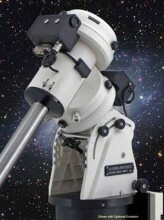 Debut of the new mid-sized mount will be at the Northeast Imaging Conference (NEAIC) and the Northeast Astronomy Forum (NEAF). In the near future our website will be updated to include those accessories which can be ussed with the 1100GTO including the 8" piers, 5-10-18 lb. counterweights, mounting plates, right angle polar scope, etc. Click the button below to add the Astro-Physics 1100GTO German Equatorial Mount to your wish list.